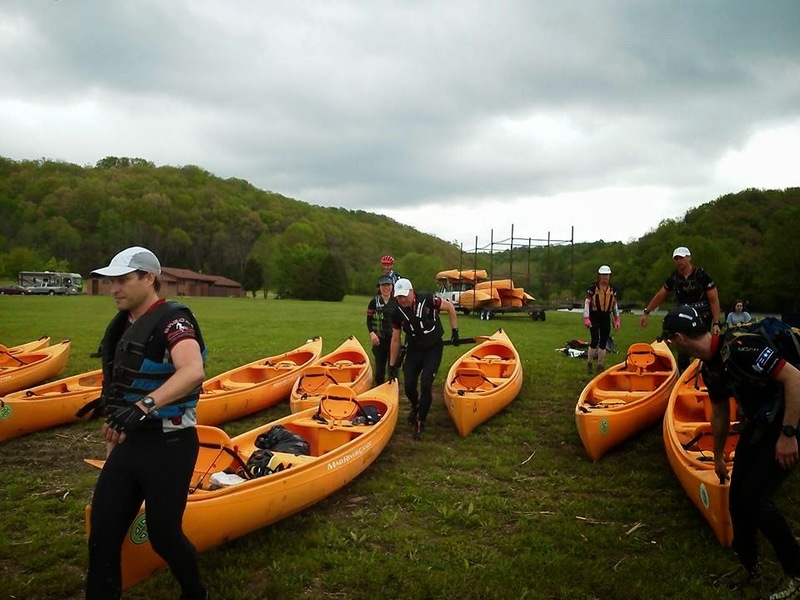 The MISSION 18hr adventure race in Versailles, IN was hotly contested this year, with the lead bouncing around between several teams throughout the day. I could share with you the race from Alpine Shop's perspective, but if you're a regular reader, you've seen plenty of that. I wanted to do something a little different for this race report. Turns out, members from the top 3 coed teams each wrote a quick race summary on AttackPoint, an online training log used by adventure athletes and orienteers across the world (and you can use it too, it's free!). I asked Hilary from Michigan Racing Addicts and Rachel from Bushwhacker if I could combine their race comments with mine, and give you a birds-eye view of the race as it developed over 18 hours. They agreed! So here it is! I've made a few edits for clarity and brevity, but kept true to their narrative as best I could. Also, sorry I don't have photos of the main USGS map we used, it's buried in David's van and we all know it could take months to extract it. MISSION follows the beat of its own slightly deranged drummer, and by that I mean there are always one or two "twists" that can be different from a traditional adventure race. First, the race almost always starts with a crazy prologue challenge. Second, the race consists of multiple loops that keeps teams returning to Race HQ/TA. Instructions for each loop are not revealed until the team has completed the previous loops, so the race is constantly evolving and requiring teams to adapt to new challenges. Part of the Race HQ area at Versailles State Park. RACHEL: Friday night was rather enjoyable as we didn't have to do any race planning or plotting. So the evening was filled with gear prep and jokes of the gutter nature. Mike and I both forgot to bring our sleeping bags and made do with sheets from my car that had bike grease on them and whatever extra clothes we had for pillows. Thankfully it wasn't too hot or too cold, but I still didn't sleep all that well. HILARY: We got pretty much NO info Friday night - not even what clothes to show up in. I guess we got a little extra sleep without having to plot and plan our routes, though I would have liked a general overview. We showed up in trekking stuff assuming some sort of foot prologue. EMILY: Alpine Shop rolled into Versailles ("ver-SALES") State Park right as dinner was about to start, and quickly met up with our friends from Bushwhacker, Silent Chasers, Michigan Racing Addicts, All-Terrain Females, and a bunch of other teams. We scarfed down a delicious lasagna dinner while listening to the Pre-Race Meeting, and then piddled with our gear until well after dark. Rachel had kindly reserved spots for us in their cabin, but when David and I went to go to sleep, everyone had already turned the lights out! What, like we have a race the next day or something? We tried to be as quiet as possible getting to sleep (or did we...), but I'm not sure anyone slept the best. I didn't find out about Rachel and Mike's sleeping bag situation until the next morning, and I'm sorry I didn't offer them any extra covers! EMILY: Race HQ was located at the top of a hill/spur (about 880'), and at 0550, Brian revealed the prologue challenge: there were 10 CPs hung at 800' elevation, and we had to find 7 of them within 60 minutes to be given the maps and coordinates for the first loop. We were not given a map for the prologue - it was a true Easter Egg Hunt! At 0600, we made the choice to run down the northwest side of the hill/spur, given that it was the steepest hillside and we figured we had the best chance of spotting the first CP, which we could then use to gauge the rest of them. This strategy worked great initially as we found the first flag almost immediately. We debated going right (clockwise) or left (counterclockwise) from that CP, and guessed left. From there, we struggled to find the remaining flags and at the end of the 60-minute time limit, we only had 6. We knew Bushwhacker and MRA were ahead of us, as well as several other teams. We were frustrated with losing time on a chance decision, as we knew that every minute counts against teams of this quality. But, the only thing we could do was keep racing hard! RACHEL: We were a little unsure of how to approach this at first, but Mike was wearing his altimeter watch, so once we found one we used that to track along the same elevation. The first area we went had some thick undergrowth and we only found 2 after 20 minutes, so we were concerned this wouldn't pan out for us. Then we found 2 more and headed to the north side of the hill the HQ was on. There we found 3 CP's in quick succession and were suddenly running back to HQ already! We were the first team to find 7, in 45 minutes. Teams were already lining up to get the instructions for the next segment once the hour mark hit - strategy to just save their legs since there was no penalty for not getting 7. HILARY: We took off on one direction... and were the only team to go that way. That doesn't bother us, though. We found one, and then continued on that contour and eventually found all 7. We got our 7th, and got back to the race start 10 minutes before the hour cutoff when they would mass distribute UTMs to those who didn't get them. Only 2 or 3 teams found 7 to get any advantage, so it didn't really have the intended effect of spreading teams out. Not a fan of this even though we got lucky and got the slight advantage. RACHEL: The first real section of the race was singletrack and road biking. We hit the singletrack first and Mike did a great job of navving us through the many trails in Versailles State Park, and picking select spots for some bike-whacking. We saw Michigan Racing Addicts a lot here, ahead of us after one of their own bike whacks, but we beat them to the first road point after we were done with the singletrack. We tried to push the pace on the road, taking advantage of our teammate Greg's super bike strength. Rode into HQ and transitioned to a paddle/trek. I think MRA came in not too long after us. Saw Alpine Shop biking in as we ran down the hill from HQ to the paddle put in, so we knew they weren't far behind. HILARY: We quickly plotted and took off on the bike leg. THIS was a fun leg. It started with bike orienteering on the local single track trails, which were very nice. We did some creative route choice and managed to take the lead for maybe 20 minutes. Then, Bushwhacker made a better route choice and passed us back. Darn. We did a little road riding with CPs off the road for short runs into the woods. EMILY: We plotted the first 8 CPs and took off on our bikes. David was a little nervous with the trail mapping and on our attack to our first CP, we took a jeep road instead of the singletrack we wanted. We took a few minutes to figure that out, then bikewhacked up a short steep spur onto the singletrack and proceeded to hit the rest of the points cleanly. The trails contoured and switchbacked a lot, giving several opportunities for creative bikewhacking, and we took advantage of that where we could. There were several teams bouncing around us as well, but we were able to get some separation once we popped out onto the gravel and hit the two road points. On our return to Race HQ, we saw Bushwhacker running with their paddle gear and estimated their lead at about 10-15 minutes. MRA was plotting when we arrived in TA but left before us. 18hr teams starting the paddle in the banana boats! RACHEL: The paddle gave us some strategy options - we were able to split up for the CPs which were located on the north part of the lake. Everything had to be punched on the same passport so this really just meant we could drop one person to trek to the points while the others paddled to a better location to pick them back up. We chose to get the only CP on the east side of the creek together on our way up to the northern-most point, drop Mike off to get the 3 CP's on the west side, then paddle back south and meet him back across from the put-in. I flubbed where to get out for the first CP and cost us a few minutes there. After we dropped Mike off and turned back downstream, we saw Hilary from MRA paddling alone upstream, quickly followed by Alpine Shop all together still, meaning they had the same strategy as us. Sure enough, after Greg and I made it to the southern meeting point, we saw Emily and Jeff pull up not too far away. Then it was a waiting game...will we see Mike or David first?? Otherwise Greg and I lounged and relaxed. Well, we did get water out of the boat and tie a daisy chain (part of our required climbing gear) to the front handle to help with the boat dragging Mike knew we would be doing soon due to a previous race experience in the area. We finally heard someone crashing down through the woods, thankfully it was Mike! He threw himself into the boat and we were off, lead intact for the time being. EMILY: We made it to the put-in in about 5th or 6th place overall, and immediately paddled northward to CP12. Since we could split up, we let David get CP12 on his own while Jeff and I waited in the boat. We ran into the all-boy team Youth For Christ here and chatted with them as David and their navigator worked together to punch. Jeff said something like "We're just waiting for our boy to get back" which the YFC people interpreted as Jeff and I were David's parents, racing as a family team. Ha! (It's funny because Jeff and David are closer to my parents' ages than my own.) We laughed about that for the rest of the race. David returned from CP12 and on our way up to the northernmost paddle point, we passed Hilary who was paddling MRA's boat by herself as Phil and Mike attacked the trekking. We also saw Bushwhacker paddling the opposite direction, having already dropped off their Mike. So we knew we were 3rd but anything could happen on the mini-trek. Jeff and I dropped David off again for CPs 10-13 and paddled south to pick him up, where we waited with Bushwhacker for a weirdly relaxing but also tense several minutes. Finally Mike emerged from the woods, and they took off! David came through about 10 minutes later, having made up some time which we were thrilled about. We portaged over the spillway/dam into Laughery Creek with MRA hot on our stern. HILARY: We got back and, as expected, we were paddling next but with a twist - we were allowed to split up on the first 4 points. We decided to drop Phil and Mike off on the south end so they could work together to get the points that were up on the ridge. I paddled the canoe solo north to what I figured was about to CP10. I had a little hand-drawn map with the river bends. It was an oddly leisurely paddle for the middle of the race. I got there, ate, drank, took a bathroom break, and maybe 5-10 minutes later, the guys showed up. Cool. We paddled back down, at a much faster pace, stopped for CP12 and somehow didn't notice the big wide path to it, probably losing more than 5 minutes looking for the reentrant in the thorny mess of roses. As we paddled up past where the guys had gotten out, we saw Alpine Shop pushing out to continue the paddle a hundred yards in front of us. Dropped to 3rd, but in sight of 2nd. RACHEL: We had to portage over the dam, then were paddling in a small, at times very shallow, creek. Lots of boat dragging and teeth gnashing. Then we got hit by a pretty severe thunderstorm - super heavy rain and some scarily close lightning. Quite a treat! Thankfully the storm passed without issue, but we were still paddling...and still paddling more after that. I didn't keep track of how long the paddle was but it was a serious section of paddling for an 18 hour race. Might have been quicker if we could have actually paddled the whole time, but who wants to do that when you can jump out and run with your boat instead? (sarcasm..) We started to see a yellow boat in the distance behind us, and our assumption that Alpine Shop would catch us on this section was coming true. They have some serious river reading skills and seem to be more efficient at the whole in-and-out-and-in of the boat thing. Finally we saw the bridge that signaled the takeout, and Alpine Shop pulled up right after us. EMILY: Laughery Creek was a slog...think USARA Nationals "adventure paddle" except longer and with less portaging and more pushing. Jeff and David were in and out of the boat hundreds of times. I was in the middle and only got out on the worst ones - it turned out to be more efficient to have just the boys hopping in and out, but of course this made me feel lazy. We hit CP14 with MRA right behind us, but after we started "paddling" again we were able to gain time on them. In the middle of this section we got rained on quite hard. but we kept working the creek and towards the end we caught up with Bushwhacker. I am proud of my teammates all the time, but after this paddle I was especially proud of them - they worked really hard on a difficult section, and we made up a good chunk of time on Bushwhacker. HILARY: We saw this river before the race and talked about how we REALLY hoped we wouldn't be hauling canoes down this super low river. Oh, we were... for 4 hours. We did get out once to get CP14 up a hill. Oh, and we got out probably a hundred times due to being stuck on rocks. Well, Mike got out a hundred times. Phil and I got out fewer times than that, but too many times by probably a factor of ten. This would have been a fine paddle with 6" more water in the river. This was one instance where whitewater was neither exciting nor scary. Just a sign of annoyance to come. About halfway down, the thunderstorm started. If it was hard to see hidden rocks before, it was pretty much impossible in the rain. It felt like forever, but it was probably only 15-20 minutes. Eventually it cleared up. We tried to tell ourselves that this would help with the water level, but I think it was wishful thinking. Not a fun section. Rachel returning back to Race HQ. RACHEL: Unfortunately our map was too wet to plot the next section, but we could see we had a significant road run to start with, so we just decided to take off and air out the map for a mile or two and try again. After a while we saw a dumpster that looked like a great table for plotting, and gave it shot. While we were finishing up the plotting and route planning, Alpine Shop came into view, running up the road at a pretty good clip. We finished plotting right as they passed, so we ran and chatted with them for a bit. They had picked up a stray dog as a fourth teammate who looked quite content to run alongside, and he stayed with them as we eased back and they pulled ahead. The first CP on the section (CP22) was in the woods and we both used an obvious road intersection to dive in. We got to CP22 pretty much together, and then we decided to book straight north through the woods instead of heading back out to the road. Alpine Shop took a different route, to our relief as we didn't want to be navving next to them for the whole trek. When we hit the next road, we had a couple of route options to the next CP (CP21). We decided to run the road east then north until we hit a trailhead that would take us to a distinct trail bend that we could use to hit CP21. The CP was in the middle of a very flat section and had no distinct feature (and the clue was "change in forest maturity" - what?? ), so we wanted to be careful. Alpine Shop chose a different route, taking the west trail instead of the east one that we used. The trail map we were given didn't match reality exactly, but the distinct trail bend we were looking for was at least there, along with a nice old horse trail that led us directly to the control. We then tried to take another trail but ended up back in the woods when that didn't match up with where we wanted it to go. We thought we saw Alpine Shop running close by and assumed they were now ahead of us. We hit the next two CP's without issue and then headed into town for the rappel. Coordinates and supplemental trail map. We plotted all of these on our USGS map as well. EMILY: After seeing Bushwhacker leave TA in a hurry, we turned our attention to our sopping wet map. MISSION is one of the only races I've seen to have "extra socks" on the mandatory gear list, and normally we would never consider carrying them for an 18hr race. But here, they turned out to be actually useful as we used David's extra socks to dry off our map and get the CPs plotted. Then we got going on a longish road run after seeing MRA take-out just as we were leaving. Close race! After a few kilometers we saw Bushwhacker relatively stationary on the roadside and were surprised to have caught them - turns out they were plotting. We had some friendly banter with them, and introduced our newest teammate - a collar-less black lab that was happily running beside us. We kept thinking it would turn around but it hadn't yet. We pulled just barely ahead of Bushwhacker on the road, but ended up all attacking CP22 together after Mike executed a freaky-fast bushwhack. We took different exit routes from CP22 which I know we preferred and I think Bushwhacker did too. CP21 had a sketchy clue "change in forest maturity" and a sketchy location - hung in a nearly featureless (i.e. flat/no contour lines) location on the USGS map. The supplemental trail map showed a large bend in the trail so we took a super-conservative route to the second western trailhead, then onto the "X" trail looking for the bend. Very little about the western portion of the trail matched the supplemental map and David was going crazy trying to assimilate both maps. We also couldn't picture what a "change in forest maturity" would look like. We ended up attacking off of the property corner boundary but no luck. We canvassed the area, no luck. I tried to ask the black lab for help but he just wagged his tail. We finally popped out onto the eastern portion of the trail and were going to relocate from one of the eastern juctions. But before we got there, we noticed an obvious bend with an unmapped, overground connector trail branching off of it. We took it on a whim and found CP21. We were happy to have got the CP but frustrated at how much time we lost! Time to GET OUT of those woods! With the dog still with us, we ran north to CPs 20 and 19. We tried to shoo it away before Hwy 50, but it crossed with us and was almost hit twice. I screamed. The dog made it to the other side alive, and we caught up with MRA at CP20. We each took different routes to the waterfall at CP19 but they were about equal after we both had trouble finding the physical punch, hung several meters above and to the side of the waterfall itself. We knew the next CPs were in town so yelled at the dog and tried hitting it with a stick. It wasn't fun but finally stopped following us. We ran as much as we could on paved Hwy 50 climb into Versailles. HILARY: We finally got out of the water a bit before 4:00pm. Alpine Shop was in TA finishing plotting the next section - a foot trek back to Race HQ. With our soaking wet map, the plotting was challenging - even with a sharpie. We got our points and started moving, but we were tired and stiff, so not as much running as we would normally do. We weren't feeling a lot of hope for catching the two speedy teams in front of us. We picked up the few points that brought us up to the North, including a "vegetation boundary" that wasn't (CP21), a weird building foundation on a hill, and a waterfall. At the foundation CP, we were surprised to run into Alpine Shop, who had picked up a buddy along the way - a friendly black lab, who befriended us as well. As we all headed out toward Versailles they yelled at the dog to make it run away, effectively pawning him off on us. We tried doing this as well, but eventually, the dog joined back up with us. Highway 50 was "legal but discouraged" by the race director, but it was the shortest way into town so we took it anyway. Unfortunately, this dog kept finding us and then randomly running out on the highway. Cars were giving us evil looks like we were the worst people ever running down the road with our backpacks and unleashed dog. I was mouthing "not ours" at them. I doubt that helped. RACHEL: I am not exactly a heights person, so climbing straight up a water tower on a rung ladder 120 feet, then rappelling back down didn't look like a ton of fun to me. Somehow I made it through getting up there without freaking out (using a song to keep my rhythm of climbing and mind off the height helped! ), but once ready for the rappel, it took an extra 5 minutes for me to figure out exactly how to get over the railing. If I were taller it would be no problem, but it was awkward for me. I closed my eyes for most of the way down too! On our way out from the tower we saw Alpine Shop running towards us, to our surprise. David said something about CP21 (the forest maturity one), and we realized they had had trouble and we now had a good 20 minutes on them. Somewhere on that trek section we all ran out of food, too. I had packed all of my food for the whole race, but knew I was short and was planning to bum off Mike and Greg towards the end of the race. However, when we transitioned to the paddle, we didn't restock their food as much as we needed to, so neither of them had more than just a few hours of food with them. I shared mine and ran out myself as well, so we were all in a definite hole calorie-wise by this time. We somehow managed to run the rest of the trek through town and back up to the HQ (okay we walked the last hill...more like plodded). I think Mike's comment was that he felt "hollow," so we knew we needed to eat, quickly! EMILY: Finally dog-free, we ran straight into town and got a split on Bushwhacker as they were leaving the rappel - I think we were about 20-30 minutes down at that point. We got to the water tower, climbed up the 120' ladder, and rappelled off. I went first and took my time getting over the railing, then everything else was fine. Except, the dog was at the bottom!! It had followed MRA instead, and I felt really bad that they had to deal with that not-smart animal on the busy road. Once the boys were done with the rappel, we got the other CP in town, and the covered bridge CP18 on the way back to Race HQ. The dog was still with us entering the park. Once back at HQ, we learned that Bushwhacker had left about 5 minutes ago but we still needed to plot the next section. HILARY: We made it to the water tower for the rappel with the dog still alive. We had to climb up the ladder to the rail on the water tower and then rappel down. The safety on the climb was a prussic, but I would have much preferred an ascender. I would have felt safer and it would have been easier than manually pulling this prussic up the rope. The climb was the hardest part. The rappel was a rappel. After picking up 2 points on the way back to the TA, we moved on to the bike section, which they said wasn't the last leg. RACHEL: Once back at Race HQ we gorged ourselves. I even ate some protein frog gel thing Mike had that was absolutely disgusting. We had a big biking section ahead of us, and knew there were even more CP's once we got done with that. This transition took a little longer because of that, but it was much needed. Finally we were on our bikes and ready to hit it. We could do the bike loop clockwise or counterclockwise, and Mike chose clockwise, which worked out really well. The first CP (CP26) actually had an extra challenge at it - we had to paddle a raft across the river and get the punch on a hilltop. The hill was insult to injury for us since we were still waiting for our food to hit our legs, but we made it back across and were happy to do that in the daylight instead of later at night. As soon as we got back to our bikes, Alpine Shop rolled in, looking strong. So we knew they chose the same route, and had made up some time on us to boot. EMILY: We plotted and zoomed out after Bushwhacker. The bike section was a big road loop that we chose to go clockwise on. It should be noted that Jeff decided to put on dry socks and his "good" mountain bike shoes for this. At the first CP, we saw Bushwhacker and initially were surprised to have made up that much time. But it turns out CP26 was a surprise paddle event and they were just leaving. We took an inflatable raft and toy paddles down to the lake, hiked it across a mud flat and then paddled to the opposite shore, hiked up a pretty steep hill for the punch, then paddled and mud-slogged back. Jeff's shoes were not dry after this fun little event and we were sure to remind him of that for the rest of the bike. HILARY: We took off on what looked to be a clean road ride so everyone put on dry stuff except me (I hadn't brought it). Our first planned point changed things. When we arrived, they told us we had to paddle a raft with mini paddles across the lake and get the point up on the hill. I hate surprises and "special challenges" like this. The water was too shallow, so we were mid-calf in muck. It was really just a gratuitous out and back in the mud to get us dirtier. Annoying and time wasting. RACHEL: After CP26 it was just digging deep to keep a fast pace on the bike. Greg and I took turns pulling while Mike waited for his calories to kick in. Mike's calories kicked in right about the time Greg started to really feel the fact that his rear brake had been rubbing the whole time, probably taking an extra 10% effort level out of him. We made it through a couple of out and backs without seeing Alpine Shop, so we were holding on to hope that we could see it through. EMILY: Once back on our bikes, we chased HARD. Jeff and David alternated the biggest pulls and I put in a couple shorties. We kept hoping to see Bushwhacker's blinkie lights appear ahead of us and it just didn't happen. Even after the sun went down, we all still felt good and I was starting to lose hope that we would catch them. The nav was simple enough on roads, and all of the drivers we encountered were very polite. On the last out-n-back, we finally saw Bushwhacker's lights, cheered for them, and guessed that they had about a 10 minute lead still. We knew the race would come down to the final trek so we rode back into Race HQ pumped up. HILARY: We got back on the bikes and hammered as much as we could. At least I felt like we were pushing the pace. About a third of the way through, my rear derailleur started acting up when I was in middle ring, so I was only able to use my big and small rings. I eventually settled on using mostly big and standing on the hills. Cross-chaining! At CP28, we had to make a choice - go down and get CP30 to try to clear the course or skip it and be sure to get back before the cut off. I was thinking we would probably make it, but the guys thought definitely not, so we skipped it. Supplemental map for final trek. RACHEL: Once we made it back to the Race HQ, we quickly plotted the last trek. We were down to a little more than an hour of racing before the cut-off, so we knew immediately we weren't going to clear the course. Mike made the decision to just go for the two closest and easiest points, and maybe a third if there was time when we got the second. We ran down to the first one, another mile or two of road running since we hadn't had enough earlier. On our way back up we saw Alpine Shop running down to it as well, and estimated that we still had about 10 minutes on them. The clock was ticking, and at this point we knew it was impossible for us to get the third. We were just going to get the second one and then wait and see if Alpine Shop was moving quickly enough to get the third CP themselves. We soldiered through the last two climbs, up to the CP and then up to Race HQ, finishing with 34/36 CP's in 17 hours and 37 minutes. After a mere 11 minutes, Alpine Shop finished, having only punched the same two CP's we got. The third place team was our friends Silent Chasers, who managed to finish the full bike loop with less than one minute to go to the cutoff!! EMILY: We got back to Race HQ with about 55min remaining and 4 points left. Bushwhacker was gone but we TAd quickly and got out as well. We thought we had time for 2, mayyyybe 3, of the remaining CPs. We saw Bushwhacker on our first out-n-back for closest CP so we knew they had same route choice. As we were running to our second CP, we had a big strategy conversation and decided that we would not have enough time for a third, so our only chance for the win was to hope that Bushwhacker got greedy with 3 CPs/overtime. We ran back to Race HQ and saw Bushwhacker waiting for us at the finish line, having made the smart choice of getting only 2 CPs and therefore the win! HILARY: We arrived at the finish missing 1 CP at 11:22pm. We still had almost 40 minutes , but DINO said we had to get 2 CPs to make continuing on the final trekking loop worth it and it didn't look doable in the time we had, so we called it a day. RACHEL: The race was tough in the regard that there was a lot of road running, which seems to be common for DINO races, and the paddle was probably one of my more memorable ones as well. I actually felt pretty good the whole race, though, so that was nice. Exciting and close race, awesome job to Alpine Shop, Silent Chasers, and Michigan Racing Addicts for pushing hard and getting it done! EMILY: Obviously we were bummed about the prologue and CP21 but what can you do. Bushwhacker ran a great race and I was stoked to see my 2 Cowboy Tough teammates crush it. As always, it was really fun to hear everyone's race stories as we all hung out eating meatball sandwiches and SALAD!!! HILARY: A 2 Male team, Silent Chasers, came in 10 seconds before the cut off with all the bike points, and edged us out for 3rd overall. We ended up with 3rd in the 3-coed, though. Overall, it was a solid race and we were happy with how we did. yeah we missed you guys out there! next time fo sho! Enjoy the reports! Just getting into it and doing small local ones. thanks Shannon! adventure is my favorite thing ever. i hope you enjoy it too! Your blog continues to be the best adventure race blog out there. Fun reading the different view points. Thanks, Dan! Your comments continue to be the best adventure racing comments out there! :) Bummed you weren't there this year, hopefully see you guys at a race sometime!